One of my favorite all time foods is Caprese Salad. When we have fresh tomatoes and basil from our garden I could eat it everyday. It is so simple to make and very healthy! 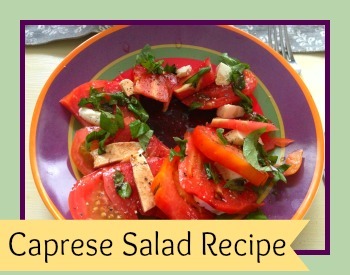 To make it, you will need balsamic reduction, tomatoes, basil, and fresh mozzarella. The great thing is that fresh mozzarella will be B1G1 at Publix next week (7/4-7/10 or 7/3-7/9)! You can get Belgioioso Mozzarella Cheese, 16 oz, for $4.09 each. Publix brand Fresh Mozzarella, 8 oz, is typically $3.99 at my Publix, so I’m very excited. If you want to buy tomatoes and/or basil, you will get the best deal at a Farmer’s Market. Publix does have tomatoes on sale for $1.99 lb though. Stir balsamic and honey in a saucepan over high heat. Bring to a boil, then reduce heat and let it simmer for 10 minutes. Sit it to the side to cool, then enjoy! Slice tomatoes and mozzarella into slices. Layer one layer of tomatoes and then one layer of mozzarella around a plate. I like to cut the basil with scissors and place it on top. Drizzle with the balsamic reduction and serve! 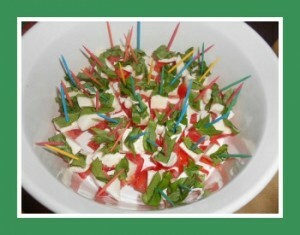 For parties I love to put one piece of basic, one slice of mozzarella, and one slice of tomatoes on a toothpick. You can then drizzle with balsamic or leave the balsamic on the side. Its a fun and healthy appetizer!